In the midst of so much devastation and destruction from Hurricane Florence, I want to tell you about a story of hope. It was only about two years ago that another storm, Hurricane Matthew, rolled into the Carolinas and severely flooded The Anchor House which currently comprises our Community Building and Cottage #1 – both structures had about three feet of water in them. Restoration required new flooring, drywall, insulation, and paint…all for a home that had never been occupied. So, for the past year, a dedicated band of volunteers, led by our Co-Founders Chris and Anna Smith, restored the Restore One home. Linda Royster, our Executive Director, hired the staff, acquired the furniture, oversaw putting in place of all the details to make this a home, a school, a place of refuge, and a licensed Residential Child Care facility. Just last month, the house-parents moved in, all the new furniture had been purchased and assembled, the four boys’ beds were made, food was on the pantry shelves, and the place had been cleaned from top to bottom. The Anchor House now looked, and felt, like a home. In preparation for the impact of Hurricane Florence last Wednesday, 9/12/18, I, Linda, anticipated the arrival of a team of folks to help us swiftly move furniture to the attic and second floor. Meanwhile, our long-awaited license from NC DHHS arrived in the mail. The immediacy of preparing The Anchor House did not allow for much celebration, although we were jubilant and mildly celebratory. A hurricane and a potential flood were threatening to do great harm to our home again- a home built for boys who have suffered so much already. We took action immediately – all furniture moved, the van was moved to higher ground, and prayers were offered up. My specific prayer last week during our prayer session was that God would put a “hedge of protection” around these structures. Then on Friday, 9/14/18, the storm hit land and it started to rain, and rain, and rain. This picture above was taken on Sunday morning, 9/16/18, at about 9 a.m., from the main road – you can see the rooftops of our buildings in the background, but you can’t see the drive under the several feet of water in the foreground. It didn’t look promising, and yet, we had to hope. We felt certain that God is as excited for us to open the house as we are – that He wants the boys, whom he already knows by name, to be welcomed into this environment of love, healing, and restoration. Sunday was a long day and I won’t lie – I was a little angry and resentful thinking about the work of rebuilding and the delay this would mean in opening. A boat excursion by two of our Board members soon confirmed that the water was about 3 inches from the back door, and no flooding had occurred! A hedge is a hedge even if it’s only 3“ wide. But, not wanting to get our hopes up, we still had a lot of water around us and the chance of the creek rising even more over the next couple of days…so, we waited and prayed. Then, the unexpected happened. On Sunday at about 5 p.m., I received the photo at the top of this blog, taken by the 13-year-old son of our Board Chair, Steven Grant, with the assistance of a drone. And it showed that there was maybe a ribbon of grass surrounding the main house where the living room, kitchen, counseling room, and school are located, and a similar small green strip surrounding the cottage that will house the four boys and house-parents. Could it be my requested “hedge of protection”? Well, as of 5 p.m. on Tuesday, September 18, 2018, I am very pleased to tell you we have received confirmation from Steven that there is no evidence of water in either building. All I can say, with tears of joy, is “Praise God”. We are ready to move forward. 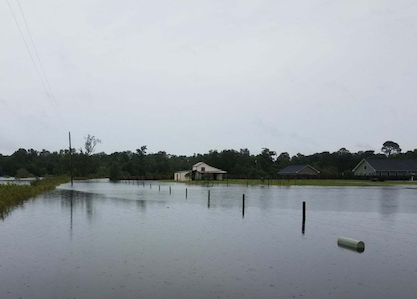 The picture below was taken at about 5 p.m. on 9/18/18 – it’s the same drive that was covered in water in the picture above. So, in the days and weeks ahead, we will be moving the furniture, accessories and food back into place, cleaning everything yet again, and preparing for the opening. Stay tuned to the website for more information about the next steps and our search for the boys who will come live in The Anchor House. How ironic that the name of the place is nautical. Maybe we should have called it “The Oasis”! Thank you for all the love and support we have received to get us this far, and please continue to pray for us as we prepare to start receiving boys.